The stomach is a muscular sac that lies between the esophagus and the upper small intestine. The stomach is an important organ. It serves as a reservoir. Different food stuff undergoes changes here. Starch hydrolysis, fat digestion, hydrochloric acid cleans it, proteins are changed, and acids start the digestive process here. The stomach is even a temperature regulator. We can however, live without the stomach. 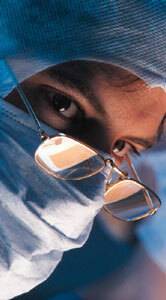 Stomach surgery is most often required either due to stomach cancer or stomach ulcers. The majority of stomach cancers begin in the innermost layer of the stomach lining, the mucosa. These types of cancers, called adenocarcinomas. This is the most common stomach cancer, about 95 percent. Lymphomas, carcinoid tumors, and gastrointestinal stromal tumors make up the other 5 percent. Cancer occurs when the cells of the stomach lining begin to divide and grow out of control, causing one or more tumors. If left untreated, the cancer destroys the lining and spreads to other part of the body. Early detection is important, but early stomach cancer has few symptoms. When stomach cancer is detected early and not too widespread, the cancer can sometimes be removed using endoscopy. The endoscope is a long tube that is inserted into the patient's mouth and esophagus and then into the stomach. The surgeon performs the surgery to remove the stomach cancer through the tube, seeing his way with tiny TV camera inserted into the tube. When stomach cancer is more developed, then cancer is generally treated by surgically removing part or all of the stomach (called a partial or total gastrectomy). After a partial gastrectomy, the remaining portion of the stomach is reconnected to the esophagus and small intestine. After a full gastrectomy, the esophagus is attached directly to the small intestine. Sometimes completely removing the entire stomach is the only sure way to stop stomach cancer. Radiation and chemotherapy may be used also with stomach removal or as an alternative. 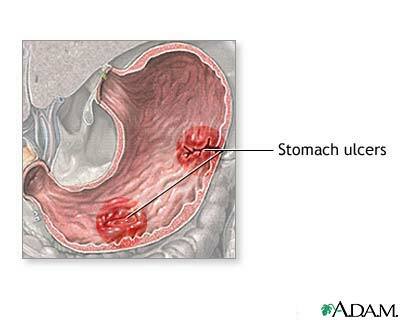 A stomach ulcer is a skin lesion or crater. An ulcer can result from infection, inflammation, or cancer. Certain foods, beverages and substances like smoking, alcohol, caffeine, and aspirin can irritate the stomach and irritate ulcers. Non-surgical treatments for ulcers can include medicines that can reduce the amount of stomach acid and lessen irritation of an ulcer. Bleeding from an ulcer can be stopped using endoscopic therapy. When medicine and endoscopy cannot control an ulcer, surgery is often a last resort to remove the damaged part of the stomach wall. The goal is to remove as little of the stomach as possible. Your doctor will advise you about which of your regular medicines you can continue to take before, during and after stomach surgery. The night before your stomach surgery, you will stop eating and drinking fluids so your stomach will be completely empty during the surgery. Nasogastric tube is a tube that goes keeps you from vomiting by removing gastric juices. It will be taken out after your normal digestion returns. Feeding jejunostomy tube is a small tube that provides your nutrition until you are able to drink and eat. Intravenous (IV) fluids will keep you hydrated. Antibiotics can be given if necessary through your IV. Oxygen may be needed for a short while through a small tube near your nostrils. A catheter can be used to drain urine, if needed. If the whole stomach is removed Vitamin B12 shots will be necessary to prevent anemia. Once your stomach and/or intestines are beginning to function normally, you will be allowed to drink liquids. Over the next day or days you will progress through a soft diet to regular food, as tolerated. Sometimes patients develop a dumping syndrome where food passes too quickly through your system. Symptoms of dumping syndrome include diarrhea, cramping, nausea, vomiting, sweating, and dizziness after eating. If you have these symptoms, contact your doctor right away.